Challenge yourself with this hiking safari where you will have the arduous but exciting task to climb up the Kilimanjaro mountain by way of the Marangu route. You will be treated with the most appealing sights once you get to higher ground! There will be spectacular views waiting for your appreciation. Be bold and take on this mountain climbing trip! 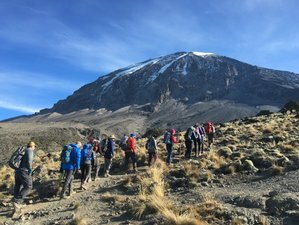 During this trekking trip, you will be staying at different Marangu route camps as mentioned in the itinerary: Mandara Hut, Horombo Hut, and Kibo Hut. After breakfast and briefing, drive to the Kilimanjaro National Park Gate (45 minutes), register and commence the climb. Walk through the rainforest to the Mandara encampment located at 9000 feet or 2740 meters. A side trip to Maundi Crater is a good way to see the surroundings including Northern Tanzania and Kenya. In the rainforest, look for towering Eucalyptus trees, bird life, and Colubus monkeys. After about one hour, you will leave the glades of the rainforest and follow an ascending path on the open moorlands to the Horombo encampment. Views of Mawenzi and the summit of Kibo are amazing. Look for giant lobelias and grounsels. You will start to feel the effects of the altitude. If you wish to extend you trek, here you can spend an extra day resting at Horombo or climbing the small peak of Mawenzi. Ascending, you now pass the last watering point, walking onto the saddle of Kilimanjaro between the peaks of Kibo and Mawenzi. Vegetation begins with upper heathland but then disappears into "moonscape". Dinner, rest, and prepare for summit climb. Very early in the morning (midnight to 2:00 a.m.), commence the climb to the summit on steep and heavy scree or snow up to Gilman's point located on the crater rim at 18640 feet or 5861 meters taking up four to seven hours). Continuing, you now ascend to Uhuru Peak, which is the highest point in Africa: 19340 feet or 5895 meters (one to two hours). Unbelievable views at every turn. Get your picture taken at the summit to show your friends. From here, you now descend, stopping for lunch and a rest at Kibo before continuing on to the Horombo encampment for dinner and a tired but happy overnight (one to two hours). This beginning of this climb is done in the dark and requires headlamps or flashlights. It will be very cold until you start descending, so you will need all of your warm layers. This is, by far, the most difficult part of the trek with many switchbacks. "Pole pole" and an optimistic attitude will get you there! After breakfast, a steady descent takes you down through moorland to Mandara Hut (2700 meters or 8858 feet), the first stopping place at the Marangu route. Continue descending through lovely lush forest on a good path to the National Park gate at Marangu (1830 meters or 6004 feet). At lower elevations, it can be wet and muddy. Gaiters and trekking poles will help. Shorts and t-shirts will probably be plenty to wear (keep rain gear and warmer clothing handy). A vehicle will meet you at Marangu village to drive you back to the Arusha Center Inn Hotel in Arusha. Dinner will be on your own. On this safari tour, you will be heading up the majestic Mount Kilimanjaro with experienced guides. The price of the package includes daily breakfast, lunch, and dinner. If you want to extend your trip, you can spend an extra day resting at Horombo or climbing the small peak of Mawenzi on the second day.